If you are a fan of world literature then you will enjoy this book by Monique Roffey, who was born in Trinidad and now London but has taught writing in Cuba and Greece. The book was listed in NPR's 10 Terrific Summer Reads. A beautifully written, unforgettable novel of a troubled marriage, set against the lush landscape and political turmoil of Trinidad Monique Roffey's Orange Prize-shortlisted novel is a gripping portrait of postcolonialism that stands among great works by Caribbean writers like Jamaica Kincaid and Andrea Levy. When George and Sabine Harwood arrive in Trinidad from England, George is immediately seduced by the beguiling island, while Sabine feels isolated, heat-fatigued, and ill-at-ease. As they adapt to new circumstances, their marriage endures for better or worse, despite growing political unrest and racial tensions that affect their daily lives. But when George finds a cache of letters that Sabine has hidden from him, the discovery sets off a devastating series of consequences as other secrets begin to emerge. Visit www.moniqueroffey.co.uk to learn more. Kami Garcia and Margaret Stohl, both revere Fahrenheit 451, which is also one of my favorites. They never intended for their story to be published, never mind having a movie adaptation of it. The real message they want to empower their young readers with is to claim yourself, to stand in your own power - it's okay to be different. Their books have now been published in over 38 countries. They both own ereaders. Although Margaret collects physical books. One of Kami's ancestors was a Confederate soldier in the Civil War. Writing from a narrative from a male's POV wasn't very challenging for them since they both had male siblings and were "tomboyish" growing up, although Kami claims they still haven't quite grown up yet. Margaret cried when she first held a copy of Beautiful Creatures and Kami thought they were being punked when they were told about the movie rights being sold. The Caster Chronicles will total four books, the third, Beautiful Chaos comes out in October but is already available for pre-order. For those of you who can't wait till then, a short story prequel to "Beautiful Chaos," titled "Dream Dark: A Beautiful Creatures Story," will be available as an e-book exclusive download on August 2! It focuses more on the story of Link, who is Ethan Wate's best friend in the Chronicles. I hope you will have a chance to listen to full interview when it's up! I spotted this amazing rendering of the giant sea goddess at one of my favorite blogs. It's by a street artist named Swoon, entitled Thalassa and it's currently on display at the New Orleans Museum of Art (NOMA), it was inspired by recent oil spill. Set in Victorian London with char-acters real and imagined, The Map of Time is a page-turner that boasts a triple play of intertwined plots in which a skeptical H. G. Wells is called upon to investigate purported incidents of time travel and to save lives and literary classics, including Dracula and The Time Machine, from being wiped from existence. What happens if we change history? 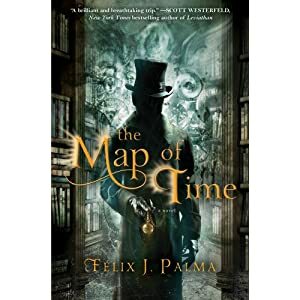 Félix J. Palma explores this question in The Map of Time, weaving a historical fantasy as imaginative as it is exciting—a story full of love and adventure that transports readers to a haunting setting in Victorian London for their own taste of time travel. FÉlix J. Palma (SanlÚcar de Barrameda, 1968) has been unanimously acclaimed by critics as one of the most brilliant and original storytellers of our time. His devotion to the short story genre has earned him more than a hundred awards. The Map of Time is his first book to be published in the United States. It received the 2008 Ateneo de Sevila XL Prize and will be published in more than 30 countries. I'm Hosting a Las Comadres LIVE Author Chat on June 27th - Hope you can come! On June 27th at 8:00 PM EST, I will conduct an interview with Kami Garcia and Margaret Stohl, authors of Beautiful Darkness, Published by Little, Brown and Company Books for Young Readers, for part of the live book chat. The rest of the live teleconference will feature additional conversations with the authors Matt de la Peña (I Will Save You, Published by De La Corte Press) and Carlos Ruiz Zafón (The Midnight Palace, Published by Little, Brown & Company Books for Young Readers). I hope you can join us! Register here! * If you have any specific questions you would like for me to ask on air, post them below in the comments section or send me an email and I will do my best to try to include it. Verde or Muerte?/Green or Deadly? A controversial gas pipeline (named Via Verde by the government and Via de la Muerte by everyone else) threatens the entire island of Puerto Rico. While opposition to the project is nearly unanimous, the administration of Gov. Luis Fortuno is determined to construct it no matter how many lives and communities are effected or how much permanent damage is done to the natural environment. Already, on May 1st, tens of thousands marched under a torrential downpour to SAY NO TO THE GASODUCTO! Many more have also signed petitions against the project and Congressman Luis Gutierrez has eloquently ripped the proposal in Congress. During this special forum, we will be joined by Dr. Arturo Massol of Casa Pueblo,the dynamic community organization based in Adjuntas, PR that is leading the effort to get this unnecessary, costly and dangerous project terminated. This year, the National Puerto Rican Parade is dedicated to the environment and Casa Pueblo has been invited to participate as an honored guest. We urge you to attend this important information session to hear the latest about this proposed gas pipeline and how it threatens the people of Puerto Rico. ** The pipeline route is 146 km long with a potential impact to over 100 meters wide and, would severely impact around 400 agricultural acres. ** It will severely affect the conservation of the of the Rio Grande de Arecibo and Rio Portuguese Watersheds and impact on many rivers including, Rio de la Plata, Río Bayamón, Quebrada Diego, Rio Cibuco, Cano Matos, Perdomo Canal, Rio Grande de Arecibo, Caguana River, River Caguanita, Pellejas River, Rio Corcho, Quebrada Arenas, Río Tallaboa, Tanamá River, Indian River, Rio Grande de Manati and Rio Yunes. ** The pipeline route is comprised of 106 km of the Karst Conservation Zone which supplies more than 25% of the total water demand of the country and directly impacts 223 acres of Special Conservation Zones. ** The presence of sinkholes and unstable terrain located within the pipeline route has some of the highest slopes ranging from sea level on the coast to 3,000 feet above sea level in Adjuntas will be more susceptible to landslides. The “Via Verde” pipeline route crosses two seismic fault lines and then continues towards San Juan, affecting 13 municipalities and 51 communities. ** Although the government says "there is a prudent separation of the pipeline from the communities"; the pipeline will pass along the side of the road that runs in front of the Levittown community in Toa Baja which is home to about 30,071 people; pass through the lands of the University of Puerto Rico in the Town of Utuado, with potential risks to over 22,854 families and students and will be exposed along sections of the Arecibo Utuado PR10 where over 13,104 vehicles transit every day. "They are violating all the rules....We need hearings, public participation," says Rep. Luis Guitierrez (D-IL). "Once you destroy the natural habitat of Puerto Rico, it is not something you can recuperate." An epic novel of love, discovery, and adventure by the author of the best-selling memoir When I Was Puerto Rican. As a young girl growing up in Spain, Ana Larragoity Cubillas is powerfully drawn to Puerto Rico by the diaries of an ancestor who traveled there with Ponce de León. And in handsome twin brothers Ramón and Inocente—both in love with Ana—she finds a way to get there. She marries Ramón, and in 1844, just eighteen, she travels across the ocean to a remote sugar plantation the brothers have inherited on the island. Ana faces unrelenting heat, disease and isolation, and the dangers of the untamed countryside even as she relishes the challenge of running Hacienda los Gemelos. 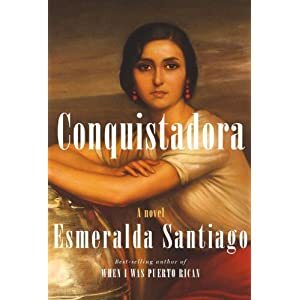 But when the Civil War breaks out in the United States, Ana finds her livelihood, and perhaps even her life, threatened by the very people on whose backs her wealth has been built: the hacienda’s slaves, whose richly drawn stories unfold alongside her own. And when at last Ana falls for a man who may be her destiny—a once-forbidden love—she will sacrifice nearly everything to keep hold of the land that has become her true home. This is a sensual, riveting tale, set in a place where human passions and cruelties collide: thrilling history that has never before been brought so vividly and unforgettably to life. If you're in the Chicago area this weekend make sure to check out the Printers Row Lit Fest. MARISEL VERA author of the upcoming novel IF I BRING YOU ROSES, on "Fictitious Lives"
Someone commissioned Bronx-based muralists TATS CRU to create “the world’s most creative marriage proposal” for his girlfriend on a wall in the East village. All together now...awww! Supreme Court Justice Sonia Sotomayor says she received nearly $1.2 million to write a memoir of her rise from a South Bronx housing project to the nation's highest court. Sotomayor reported the payment for the as-yet untitled book from Knopf Doubleday Publishing Group in an annual report of personal finances, released Friday for the justice and her eight colleagues. The book will come out simultaneously in English and in Spanish, but no release date has been set.